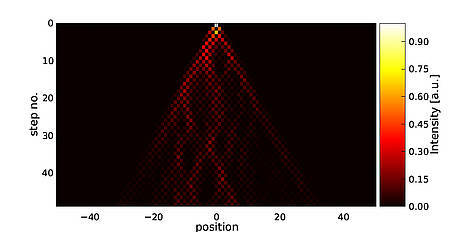 In the group there is already a successful photonic quantum walk implementation running, based on a fiber loop architecture using time-multiplexing techniques. With this setup we have already demonstrated quantum walks in one and two dimensions, quantum to classical transition, Anderson localization and percolation. 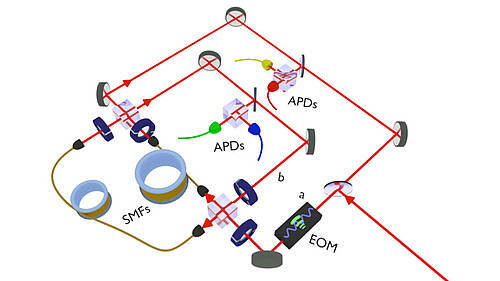 The next step will be to combine such a quantum walk loop architecture with an efficient single photon source available in the group to study multi-particle effects. The content of the master thesis therefore is to rebuild the quantum walk setup for a wavelength of 1550nm which will be compatible with the source and to optimize it for the maximum number of steps. With fast electro-optical modulators we can directly address the internal degree of freedom position- and time-dependently, which will allow us to investigate the time evolution of a walker facing a noisy environment. For weak noise the quantum interferences will not wash out immediately, but surprising branching patterns occur in the intensity distribution which are already found in completely different contexts, e.g. ocean and tsunami waves, electron waves in semiconductors with defects or microwave flow in cavities in presence of disorder. You will work within the quantum walk project together with PhD students and a Post-Doc, so you can benefit from our knowledge and experience. But you will have also the possibility to work independently on your setup. An extension to a subsequent PhD thesis can be possible.